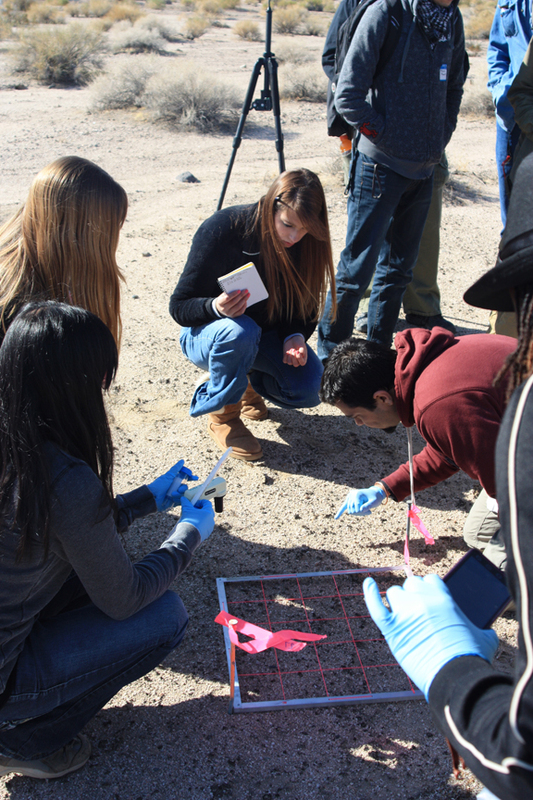 On our fourth day at the CSU Desert Studies Center on Zzyzx Road, we continued our analyses of the biological soil crusts and began to put together the results of our studies. 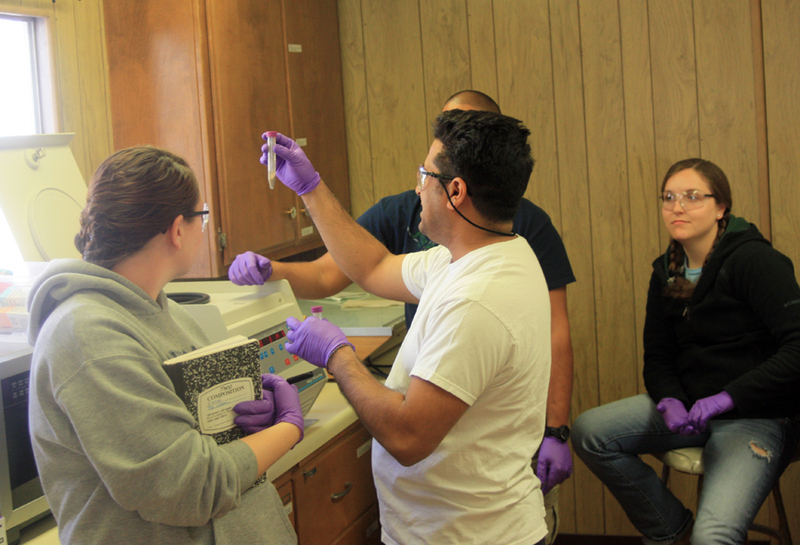 The CSU students extracted chlorophyll from the crusts and the soils underneath, then measured amounts by looking at infrared absorption lines at several wavelengths that are characteristic for chlorophyll. 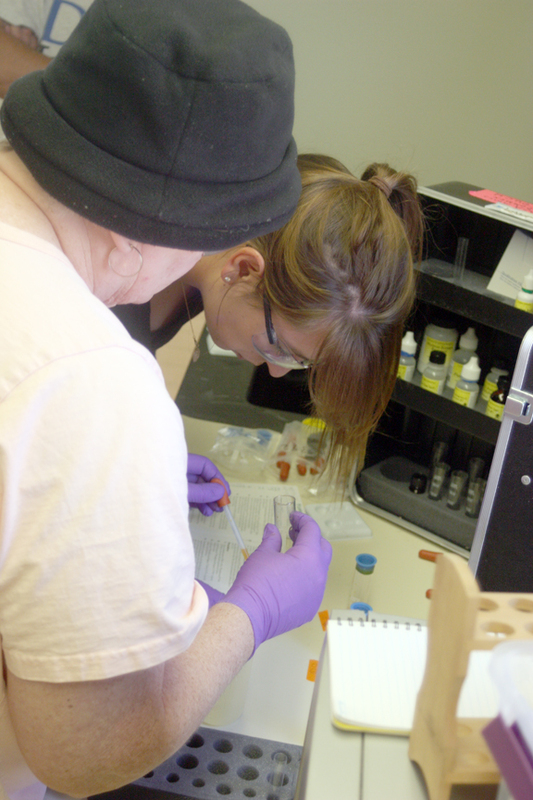 I helped Mary Beth start mapping out the trends we saw in the various chemical analyses of the soils at the three main sites. She did most of the work, looking up geological maps of the area around Baker and the various types of rock outcroppings and unconsolidated valley fill deposits, then located all our sample sites from the GPS coordinates we’d recorded on Monday and created gradient arrows across the maps showing how the various elements and compounds trended between locations. Most of the trends were to be expected, but a few were surprising. For example, there was more aluminum and calcium in the soil at the low density site than at the other two. We joked that all the pop cans left as trash scattered around the low density site (which was near Baker) might have been the source, but of course that would be impossible – it would take a huge number of cans, completely oxidized away, to leave any kind of aluminum residue. So we looked at the maps for possible sources. This site was in more of a playa lake bottom and probably has more clay in the soil (which we can confirm with the soil mechanics group), and clay is an aluminum silicate. The calcium could come from nearby limestone deposits. 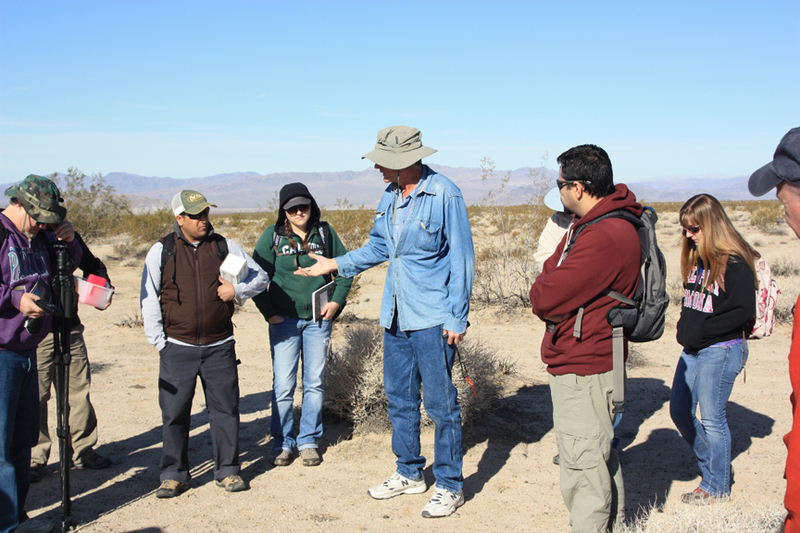 CSU Desert Studies Center on Zzyzx Road in the Mojave National Preserve. 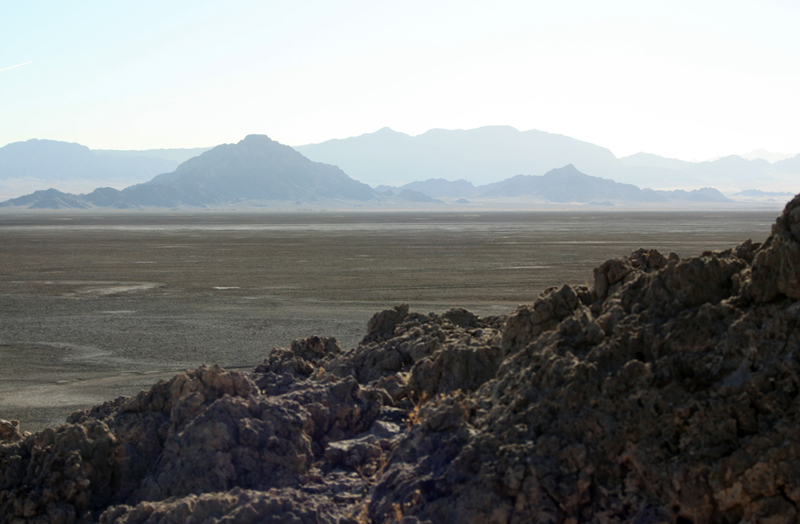 Baker, CA is in the distance. Overall, our project is a good example of how field research is carried out –you start with a question and a site to test it at, consider the possible ways to isolate the data you need from all the other variables in the environment (such as pop cans), come up with experimental procedures and protocols, then travel to the site, collect the data, conducting both field and laboratory analyses, then analyze the results and try to make sense of it all. It isn’t quite the formal scientific method we teach in middle school science classes. Often the statistics aren’t as strong as you would like because you’re using ANOVA (analysis of variance) or MANOVA (multiple analysis of variance) techniques. Since many different conditions are being tested, and you have to see how they all stack up and compare, often there are only a few data points per data set. It’s not as neat and predictable and controllable as a lab experiment, but it’s a lot more fun. For us, our biggest problem was trying to draw conclusions from the tests we ran, which were more qualitative and less reliable than we would like. The one test kit was designed for gardeners to use, and had test strips that only showed low, medium, and high results without any kind of ratio data. We also had some more individual tests for specific elements and compounds (such as chlorides or sulfates) that were a bit more numeric (at least they had scales) but not much more reliable. Often when we tried to do a sample a second time, the results weren’t very consistent. So we’d have to run the test a third time, or try to filter the soil better, etc. For our final results, we can’t rely on these inaccurate field tests. 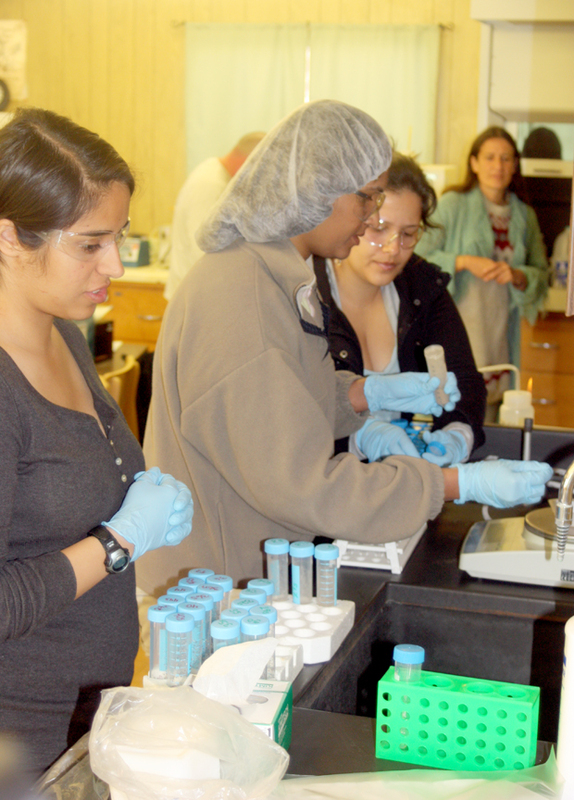 We’ll have to send the samples in for detailed lab analysis to find out the precise percentages of different elements. It will be interesting to see if our field results match up. Stripes in salt falt where borax and soda have been scraped up. I also took the opportunity to climb a low hill behind the lab with my camera equipment to get a good look at the surrounding desert. From up there, I could see back to Baker and I-15 in one direction and toward the Kelso Dunes and deeper into the Mojave National Preserve in the other direction. 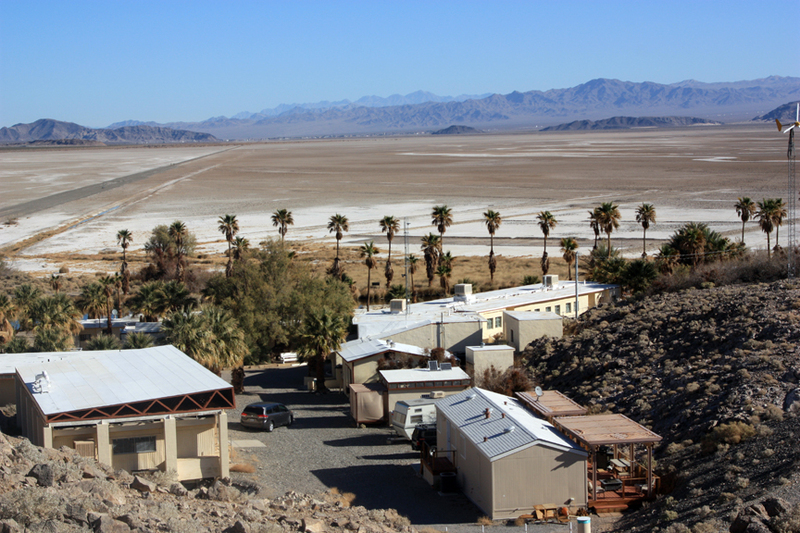 This research station was originally a way station on the overland stage route, then eventually became a center for borax mining. 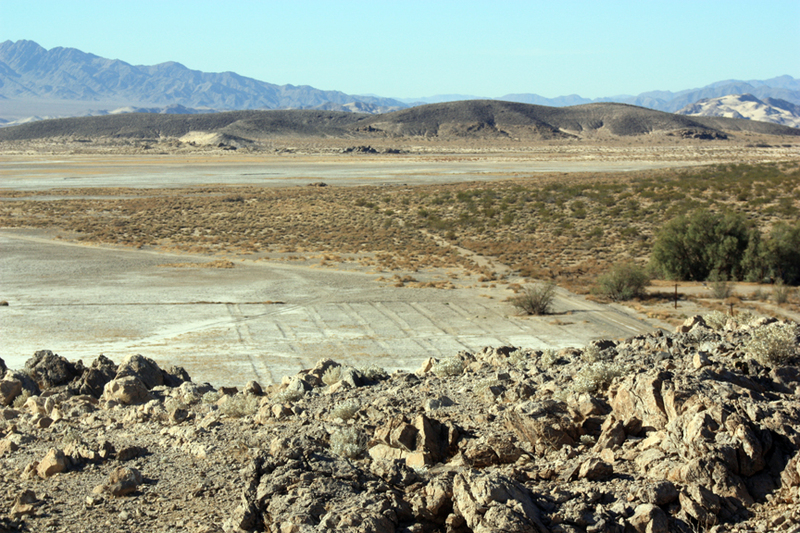 On the other side of the hill, parallel trenches can still be seen where the borax powder was scraped up and piled, to be shipped out by the famous 20-mule teams. This is the low point in this valley and a salt flat/playa lake surrounds the Soda Springs area. It probably looks pretty barren and inhospitable to most people, but this is the kind of scenery I’m used to growing up in the Pahvant Valley of western Utah, with Sevier Lake and frequent evaporated alkali deposits to the west of my father’s farm. The weather has gradually warmed up from the freezing wind that greeted me on Sunday night. 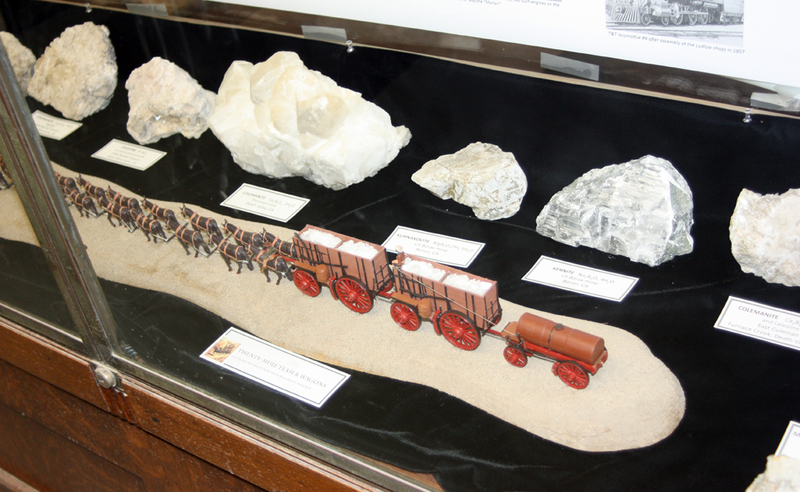 Borax minerals and a model of the 20-mule teams that hauled the borax. 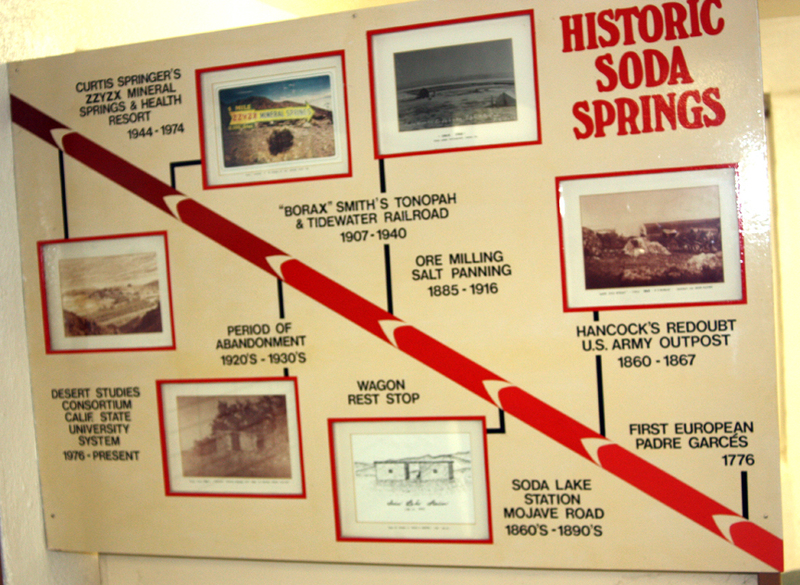 The commons room has some displays showing borax crystals and brief descriptions of how the mining was done, as well as the natural history of the station with local flora and fauna. The boron compounds (usually borates such as sodium and calcium borate) are generally known as borax, and have many uses. Borosilicate glass is highly heat resistant and is used in chemical lab ware, where we know it as Pyrex. It is also being used to contain and store radioactive wastes; since glass is highly stable chemically, the spent nuclear fuel rods are mixed with the glass in the form of marble-sized spheres or as sheathed glass columns. Borax also helps to extend laundry detergent, and provides the green color for fireworks. I use borax to create the cross-linked polymerization when I make “gak” in my chemistry classroom. Here’s the recipe: take two paper cups. In one, fill it about ¼ full of warm water and ¼ full of white glue, plus a little food coloring. In the second cup, fill it about 1/3 full of warm water and about 10-15 grams of borax powder. Stir it up well, then mix the two cups together and keep on stirring. At first it will be a sticky mess, but in a minute or so the cross-linking between the glue strands will begin and water molecules get trapped in the borate links, making the whole thing into a fun, gloopy concoction that can be kneaded and molded. 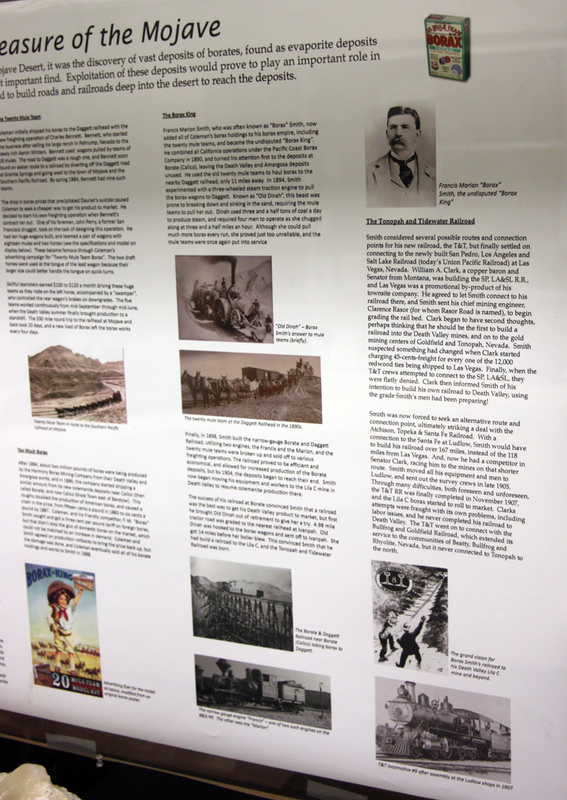 I am including here two photos of the poster that describes borax mining, which you can read to find out more of the history. I’ll create a dedicated post later on going into more detail after I do some more research. Lab Building at the Desert Research Station at Zzyzx Road, CA. 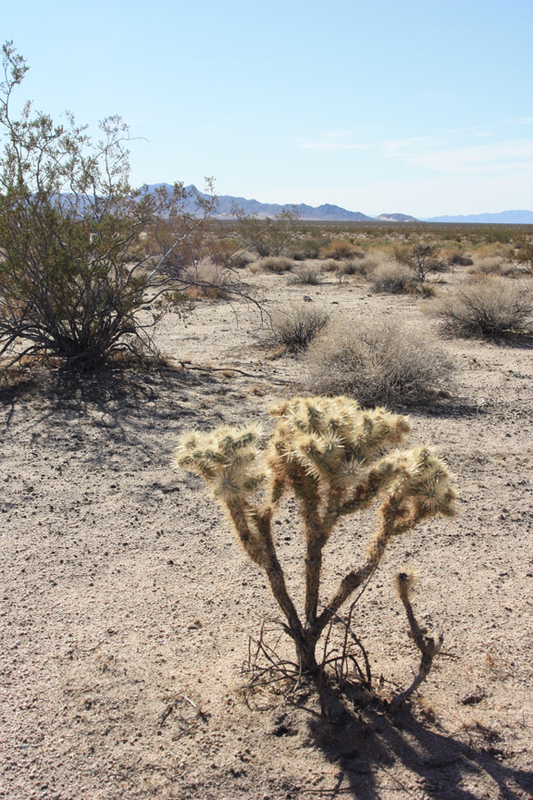 On this third day of our research project in the Mojave Desert, we did a series of tests on the biological soil crusts and soil samples we collected yesterday at three sites along Kelbaker Road near Baker, CA. 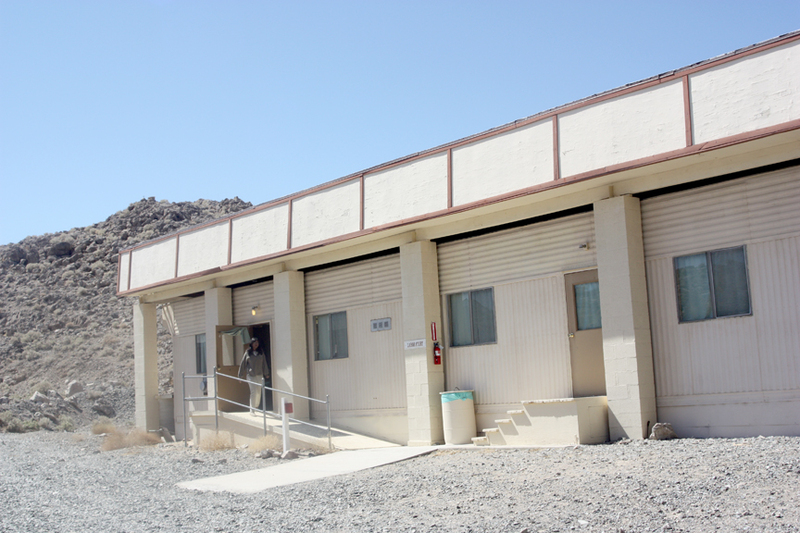 The laboratory building at the Desert Research Station is set up with standard equipment for chemical and biological tests, including flasks, test tubes, Bunsen burners, sinks, a fume hood, etc. Most of the detailed equipment and supplies was brought by Rakesh Mogul and the other scientists working on this project, including a centrifuge, a spectrometer, pipettes and pumps, and test kits and reagents for the extractions and analyses we’d be doing. 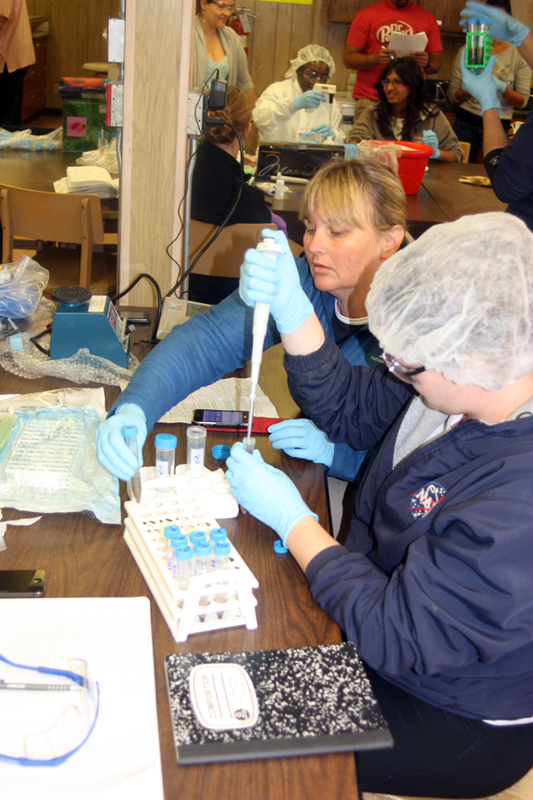 The students and scientists had set up a series of protocols for the tests and a plan of attack for how to identify each sample. First, a group were taking samples of the crusts at each location and extracting the DNA from them. Each time, the scoop was sterilized with a Bunsen burner. The solution was then centrifuged to settle out the non-dissolved portions. 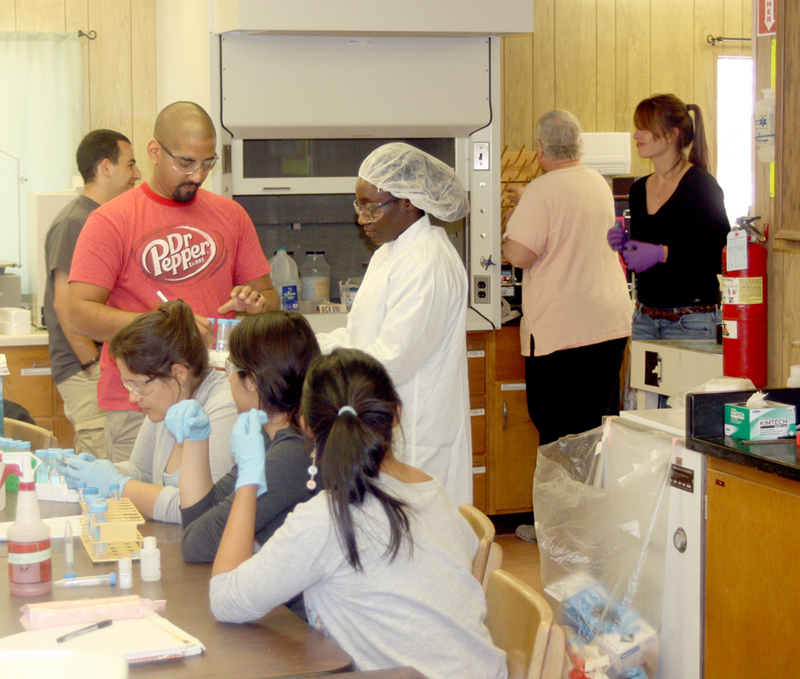 Another group was at work using polymerase chain reaction techniques to increase the DNA yield so that the final sequencing could be done in a specialized lab. We’ll have the lab look at the specific species in the crusts, including the cyanobacteria, fungi, lichens, mosses, and archaea present in these symbiotic communities. 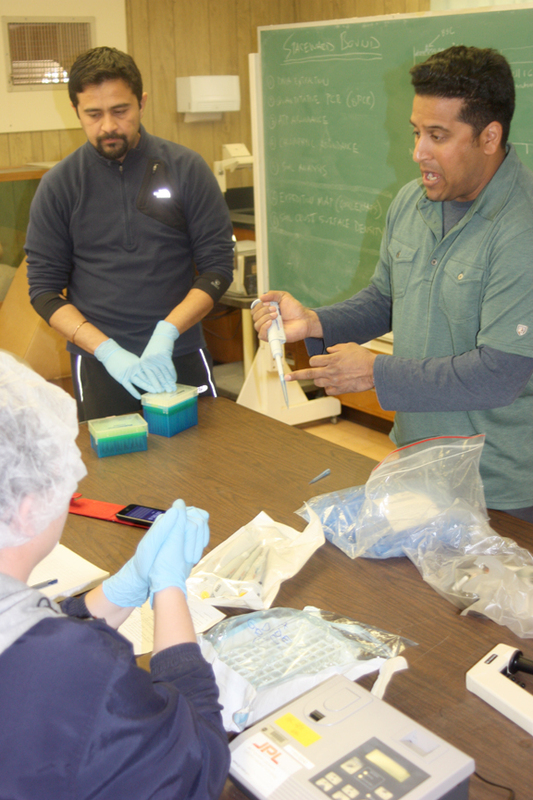 Parag Vaishampayan worked with a group to extract ATP (adenosine triphosphate), which will give us a measure of metabolic rate in the crusts at each site. We sampled not only the crust itself but the soil directly underneath each sampled crust, and will look at ATP of the crust compared as a ratio to the ATP in the soil. The hypothesis is that the healthier crust will have a higher ratio. Meanwhile, the soil itself was analyzed. Mary Beth Wilhelm and Liza Coe used a soil test kit to look for trace elements in the soil, such as aluminum, iron, chlorine, and magnesium. 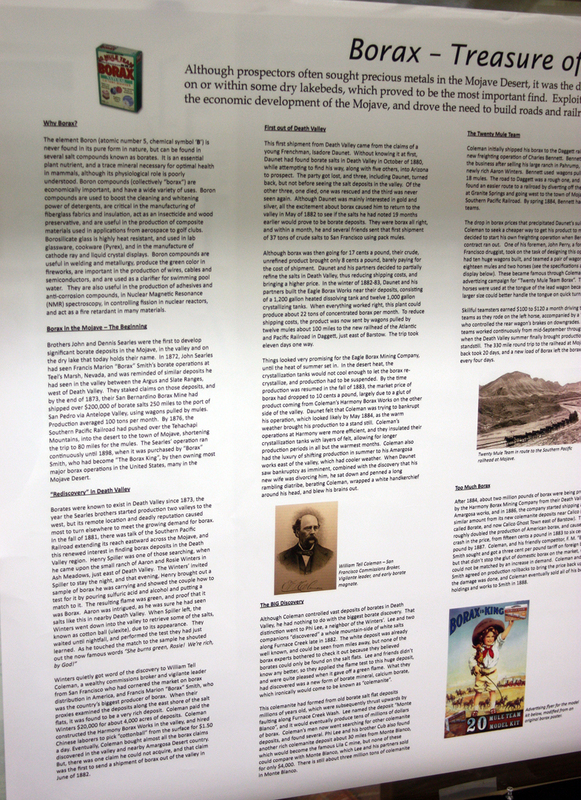 I helped do some of this analysis, since my background is in chemistry and geology. Rosalba Bonaccorsi, Ruben Hovanesian, and Leonard Bacon separated the soils using sieves to find the relative sizes of particles and materials at each site. A final group of pre-math teachers developed a series of statistical tests to look at results of all these tests, including some ANOVA (analysis of variance) tests, which I vaguely remember from my masters degree program. We got quite far with the tests today – it helps to have a group of people who are experienced and work well together. 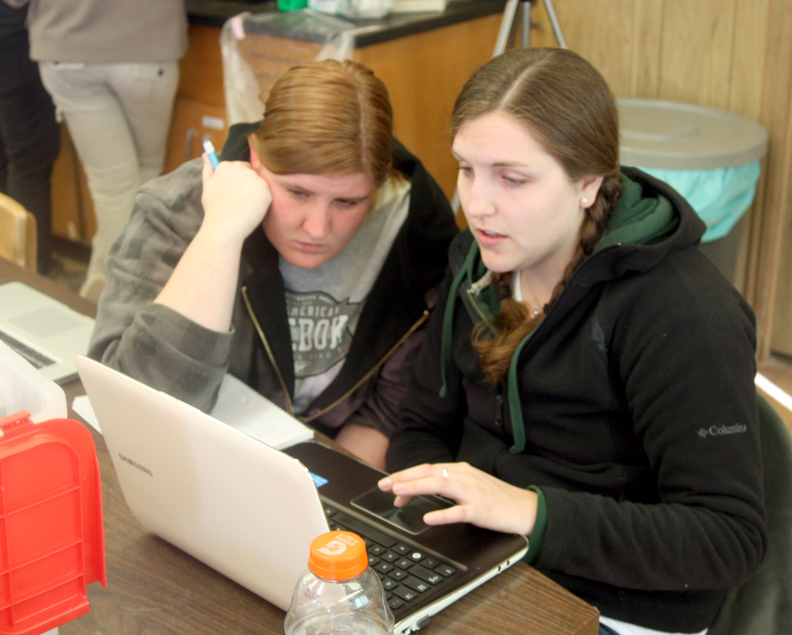 Although they come from all over the California State University system, the students are all in their second year in the program and know what to do and what each other’s strengths and weaknesses are. We all helped out where we had experitise. It was fun to see what college students can accomplish. We have one major remaining test for tomorrow: chlorophyll extraction and spectral analysis. I also talked with Geoff Chu, Paul Mans, and Ryan Piaget from NASA Ames who are developing a prototype rover built from a commercial off-the-shelf RC car, with video camera provided by an Android phone controlled from a laptop over a local network. Motor servos are controlled by an Arduino brick. 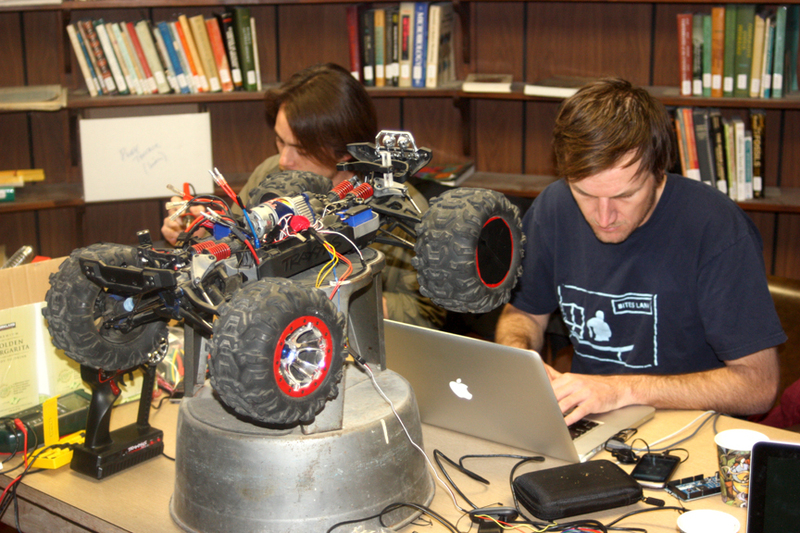 The point of this rover is to analyze the soil crusts remotely without having 20-odd people stomping around on them. The rover will be equipped with a stereoscopic IR camera that can read 3D depth, along with an RGB camera. My goal is to take the height data from the IR camera and convert it into a grayscale heightmap of the various crust locations, then turn the heightmap into a 3D model in Daz3D Bryce. The RGB photo will be mapped over the top of the model as a texture. 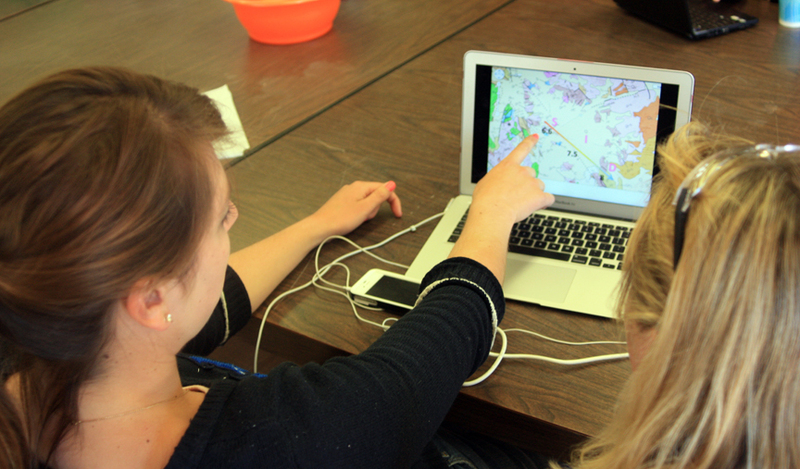 Ultimately, the model can be uploaded to an online app where people can rotate and explore the crusts themselves. 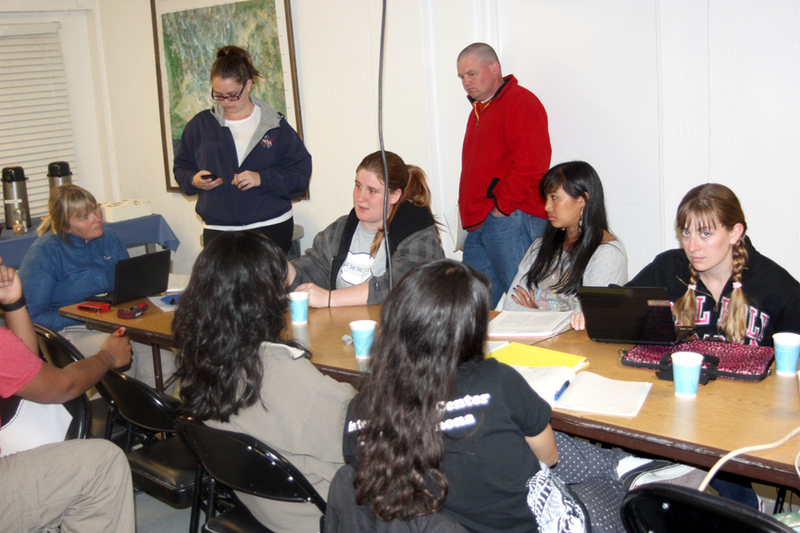 We had a preliminary results meeting after supper to look at what we have so far. The ATP analysis was not consistent across sites, possibly because the results changed as the day warmed up, but we’ll send the samples to labs for more accurate results. 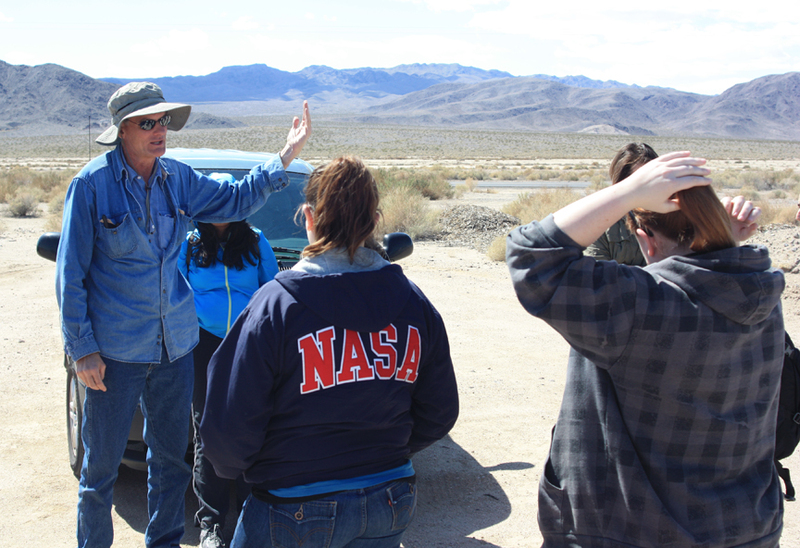 I’m in the Mojave Desert with a group of astrobiologists from NASA Ames, JPL, and the California State University system, along with student teachers in the Spaceward Bound program. 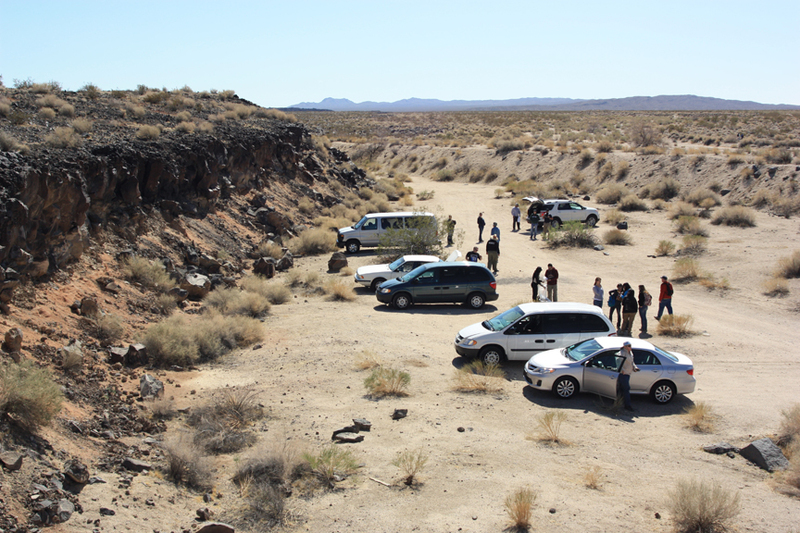 Today, March 19, 2012 we officially began the main activity of this field research: collecting samples of biological soil crusts. We hope our research is on the cusp of crusty research . . . or something like that. We have two questions: First, what are the components and abundances of crusts in various locations; and second, what causes these crusts to change density from site to site? We discussed how to approach these questions on Sunday night and decided on an experimental procedure. Dr. Rakesh Mogul first led us in an activity on assigning planetary protection protocols to various types of space missions as a way of looking at the variables and possibilities of contamination. Then we got down to business on the study itself. 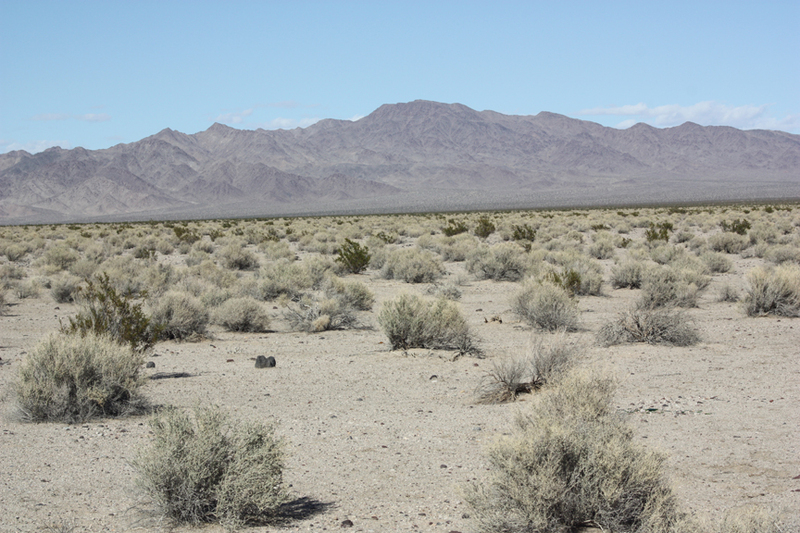 We decided to sample three locations along Kelbaker Road, which heads east from Baker across the Mojave National Preserve to Kelso Depot. 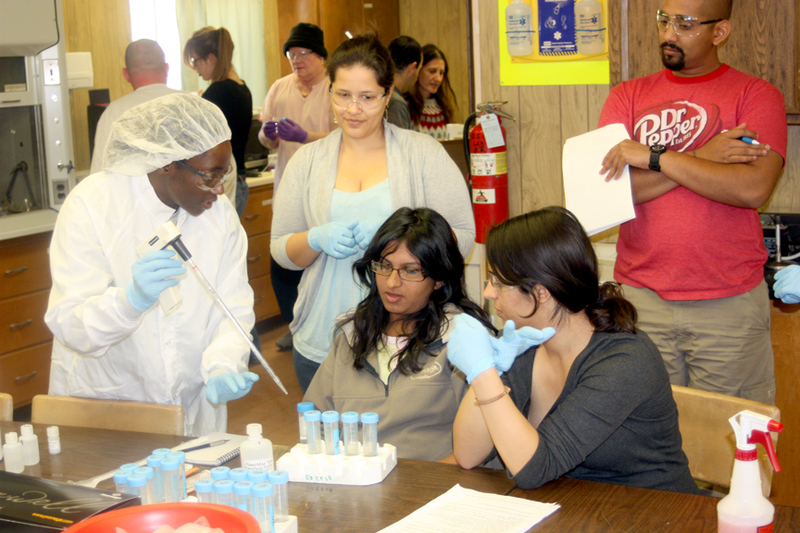 We brought with us sampling tools and equipment, including a field handheld ATP analyzer and collection tubes. We collected after breakfast on a cool morning. The wind had calmed down from the night before and it looked to be a beautiful day as we loaded the vans and headed out. We stopped first at a site about five miles east of Baker which had been scouted out earlier. 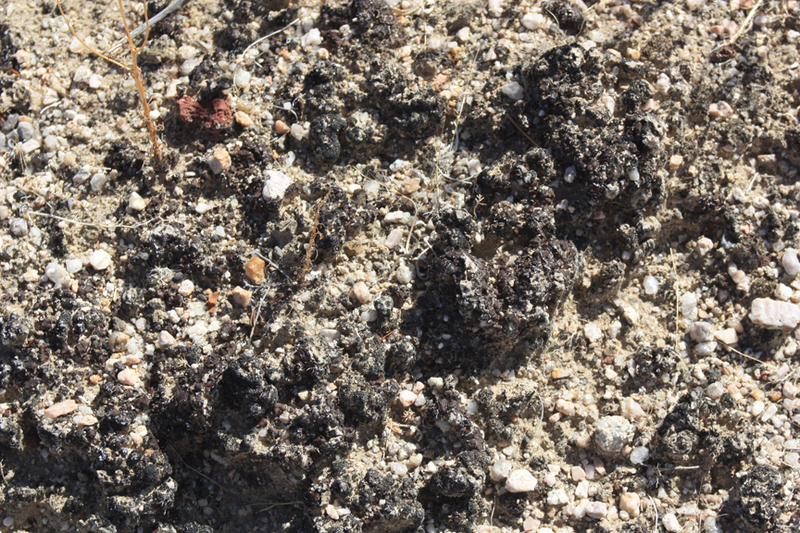 This site had an intermediate or average amount of biological soil crusts (BSC). Chris McKay described the general goals at each site, and Rakesh worked through the procedures as we divided up tasks. 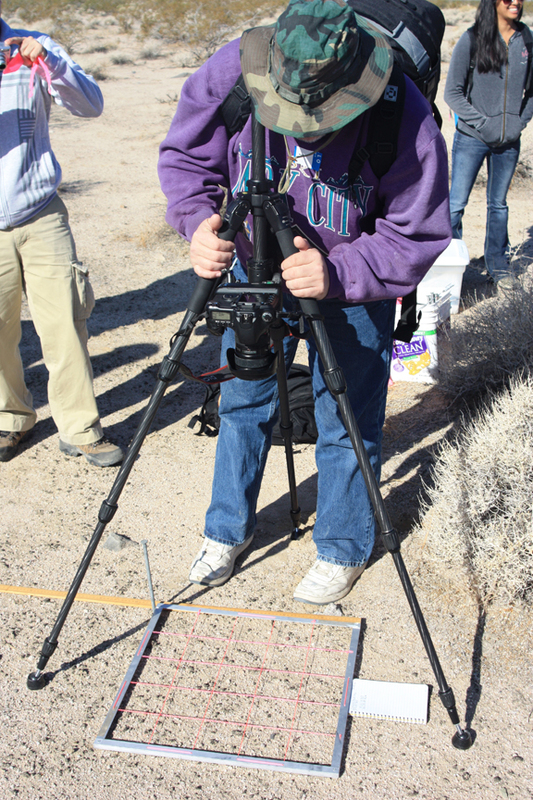 We had several things we needed to do: First, locate an origin point with an average amount of soil crust and lay down a frame and grid aligned to the compass and its GPS coordinates recorded. Then we set up a vertical tripod and took photos of the location. All of this was to allow for determining the density of the crust – how many of the grid squares were covered. 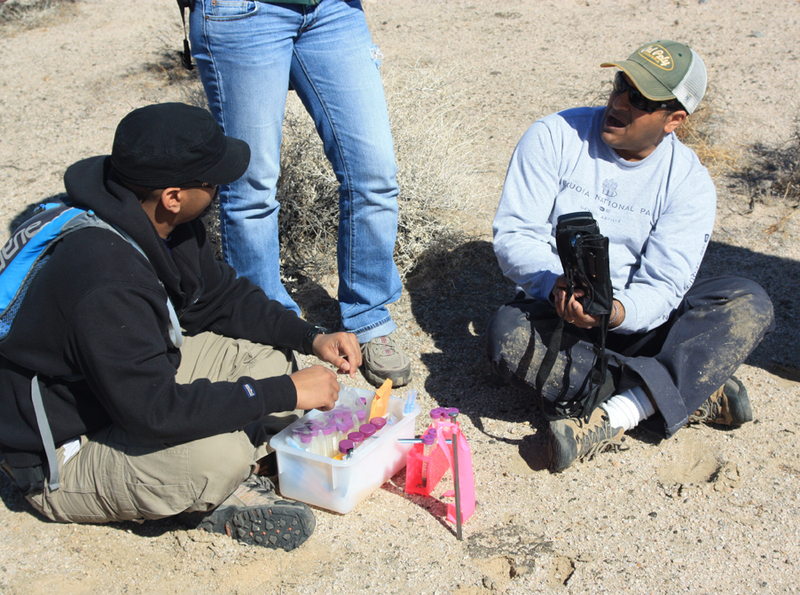 Third, Dr. Parag Vaishampayan of JPL collected samples near the grid, both of crust and non-crust areas, that we would use to extract the DNA and perform polymerase chain reaction (PCR) procedures to increase the DNA for testing (this would be done back at the Desert Station lab). We also collected soil samples to analyze chemically. At each location, we also sampled four other locations, each randomly selected using GPS coordinates in an array around the original location. With all this done and samples labeled and stored, we moved on down the road to the second site, this one with a dense growth of BSC. We ate lunch, then followed the same procedure to collect samples at five locations at the site. Since the crust was so dense, we had to be very careful not to step on any areas unless there was a wash or stream without crust. We then loaded up again and travelled back through Baker to our third site about two miles west of town across the road from Silver Lake. Here, the soil was very poor in soil crusts – we found a few small spots about the size of a quarter coin, all surrounding small puddles where organic matter and water had ponded. The BSC was much lighter in color and much sparser. We followed the same procedures, setting up grids, collecting samples, testing ATP, etc. Site 3 near Baker, CA. By then the afternoon had worn on and it was time to head back to the Zzyzx station. 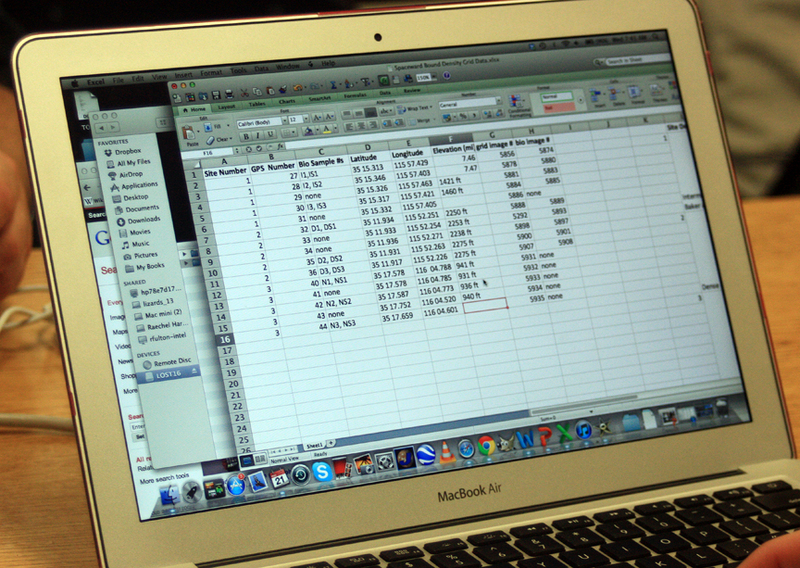 As soon as we got there our math wizards started setting up statistical searches and crunching the numbers. Tomorrow we’ll do the laboratory tests and prepare the samples by extracting DNA, sorting the soil, and testing the soil chemistry. We hope our results will be worthy of publication in their own right, as well as point to future ideas and techniques for studying life on other planets.